The Musée des Beaux-Arts de Lyon’s graphic collection is not well-known and generally speaking underrated, except for 19th century French drawings which have been showcased in several exhibitions and publications. It would be surprising, however, that one of France’s major museums not hold at least a few beautiful old sheets. Thus the museum is currently starting, along with Italy, a series of exhibitions and complete catalogues in the aim of providing a thorough study of its holdings. Lyon owns about 280 Italian drawings. Sixty-one are on exhibit and are accompanied by entries and coloured illustrations. The others are reproduced in black and white, in a reduced format, which is nonetheless legible. 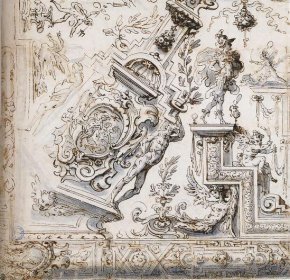 Despite the excellent exhibitions in 2006 listing 17th and 18th century Italian drawings in provincial museums (see article in French on La Tribune de l’Art), the number of unpublished sheets is remarkable, not to mention those with new attributions. This can logically be explained by the fact that a field such as this one is hard to exhaust, a lucky fact meaning the promise of more discoveries to come. The visitor therefore will find few already-known works such as the study for a Pietà by Filippino Lippi (cat.1), Saint Michael and the Condemned Souls by Luca Cambiaso (cat. 28), The Sacrifice of Iphigenia by Giambattista Tiepolo (cat. 61) and Christ on the Cross, Saint John the Baptist and the Holy Women by Castiglione (cat. 46). 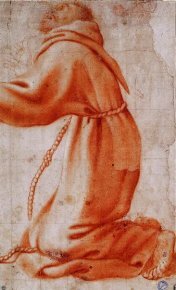 Most of the drawings will constitute a discovery, even if some, such as the sublime Saint Francis by Bartolomeo Schedoni (cat. 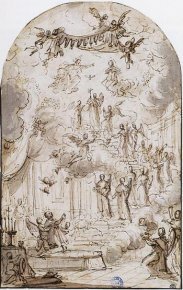 37 ; ill. 1) and the Study for a Saint Lucy Martyr by Domenico Piola (cat. 48), were presented in the 2006 exhibitions. Still, these shows, which had to be selective, had merely pointed out, without offering reproductions, the most important sheets such as the two portraits by Ottavio Leoni (cat. 27 ; ill. 2). 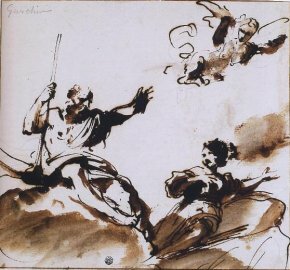 A drawing which had been mentioned as being from the “Guercino School” is shown here to be, rather, by the master’s own hand (cat. 39). Among the new attributions, there is a beautiful Juno Imploring Acheron by Pier Francesco Mola (cat. 43 ; ill. 3) and a study for a pendentive (Saint John the Evangelist ; cat. 49) by Lorenzo de Ferrari. The unpublished sheets, too numerous to list here, include a large Architectural Perspective ascribed to Ferdinando Galli Bibiena (cat. 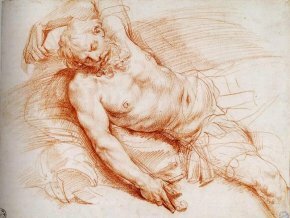 58), a beautiful Volterrano-like red chalk ascribed to Cosimo Ulivelli (cat. 45) and a Christ with Column, front and back, by Palma Giovane (cat. 33). The exhibition is remarkably presented (as usual in Lyon), offering veritable short studies for some drawings with the help of sheets from other museums for comparison. 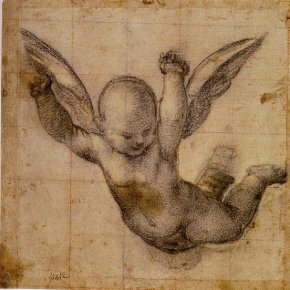 Thus, Lyon holds a fine black chalk representing a small flying angel by Fra Bartolomeo (cat. 2 ; ill. 4) (an attribution which had never been lost) and which is the subject of an in-depth study, accompanied by a drawn replica and a drawn copy both held in Rotterdam. The intended location of these various studies and their status are examined in detail in the respective catalogue entry. Five years ago we had reviewed here the excellent volume which studied the Italian drawings from Orleans written by Eric Pagliano (see on La Tribune de l’Art, in French). We will take time to go over this new contribution, by the same author, as it is sure to set a milestone in the study of Italian drawings. Pagliano is a young curator who has quickly become one of the foremost authorities in the field . By describing, sheet after sheet, the different stages leading to the attribution, the author demonstrates, if need be, that connoissorship although not an exact science is anything but an art of divining, that he bases himself on facts and, above all, that he guides the art appreciator far beyond the simple question of knowing who executed a certain drawing. The attribution searches the artist’s milieu, his intentions, the influences he undergoes, the work’s intended location, etc. The act of ascribing a work means asking hundreds of questions in order to better understand the artistic process. Thanks to this book which breaks down the mental progression by which a convincing name is found, it is obvious that it is useless to artificially confront, as too many do, attribution and interpretation. An attribution can lead to reflection. Indeed, the second stems from the first. For, how can one reflect on an art work without knowing who produced it ? How can one draw any conclusions concerning a certain painter or school if the work is by another hand ? In fact, the different approaches (including documentary research) complement each other and are all indispensable. The method followed by Eric Pagliano in this catalogue is thus original and pedagogical, supported by simple and clear language which takes us straight to the heart of the attribution, his conjectures, his doubling back and his conclusions, some of which are hypothetical, others of which are fully satisfying. In the case of some of the drawings, the attribution seems obvious…to those who are already familiar with it. Still, someone had to come up with it. There should be no fear of questioning what seems to be an established fact and it is important to continuously ask : is this drawing really by the master whose name is given ? Thus there are many ways of attributing a drawing (and mutatis mutandi, this applies also to a painting or a sculpture). Let us take some examples from the catalogue. Sheet cat. 12, representing a Study for a décor for ceiling or vault with grotesques, which appeared in the collection with the title “Unknown from 17th century French school” (ill. 5), could not fall under this category. It was obviously from the 16th century, but Italian. The analysis was based on the subject : grotesques. Three artists (here we summarize the entry) specialized in this type of representation in the second half of the 16th century (the period during which this drawing was produced) : Marco Marchetti da Faenza, Cristofano Gherardi known as Il Doceno and Raffaellino Motta da Reggio, giving us a lead, quickly confirmed by comparing with several sheets at the Louvre and in Munich by Marco da Faenza which appear close to this one. However, it is impossible to connect it to an existing décor, which would help in definitively confirming the attribution. As the style is not characteristic enough, the work will continue to bear a cautious “attributed to”. Perhaps one day a further element will surface and thus validate, or invalidate, its identification. Good reason for always being extremely cautious. For each drawing, successive attributions (and their artists) are carefully listed in a special section reflecting the difficulties involved. In the case of other drawings, the reasoning arrived at is absolute certain and runs little risk of being brought into question again. Thus, and there are many examples, cat. 16, a Virgin with Child, by Alessandro Casolani. The entry describes in detail the manner in which he elaborated the composition. Cat. 20, a study for Sisera Sleeping (ill. 6) by Cavalier d’Arpino does not really raise any doubts in its attribution either. The work can easily be linked to an existing fresco. On the other hand, it poses many questions concerning its role as another, almost identical, sheet which is much smaller, representing almost the same subject with just a few variations, is held in Berlin (and exhibited in Lyon). Why are there two such accomplished studies in such very different formats ? Which came first ? For Eric Pagliano, the answer is the one in Lyon because it “presents many repentirs […] a tangible sign of a search in progress”. On the contrary, one might consider that the opposite is more probable, with the German drawing showing later searches, notably in the positioning of the left arm, sketched in the Lyon red-chalk work, or the legs which are barely visible since they are hidden by Jaël in the fresco. The Berlin study would thus not be a ricordo but in fact a preliminary, very accomplished, study which might have served as a model for later compositions as suggested by Eric Pagliano. middle of the 18e c.
Some drawings remain anonymous and are for the most part rejected in the second half of the catalogue. The milieu and the approximate date can nonetheless be suggested at times as for cat. 13 situated in Rome around 1565-1570 or cat. 57 (ill. 7) for which the author hesitates between Rome and Naples. Others are situated simply in Italy without a more precise regional location. No doubt their publication will elicit identification in some cases. We would like to point out that this exhibition and this very innovative catalogue received the welcome help of the Institut National d’Histoire de l’Art which Eric Pagliano attended. Following the recent posting of the database for Italian paintings (see news item of 26/6/08), this new undertaking marks another successful achievement for this institution. As for the museum in Lyon which is now in the process of examining its graphic holdings, we look forward to the ongoing results which will soon focus on French drawings. Eric Pagliano, Dess/e/ins italiens, Somogy Editions d’art, 2008, p. 296, 35 €. ISBN : 978-2-7572-0223-4. Of further interest, the Musée des Arts Décoratifs has asked Eric Pagliano to quickly organize at the same time a small exhibition on its Italian graphic holdings (through 26 October 2008). We have not seen this show for which we will soon publish a brief notice. Visitor information : Musée des Beaux-Arts, 20, place des Terreaux, 69001 Lyon. Phone : +33 (0)4.72.10.17.40 Open Wednesday, Thursday, Saturday, Sunday and Monday, 10.00 to 18.00. Friday 10.30 to 18.00. Closed Tuesday. Admission : 6 € and 4 €. 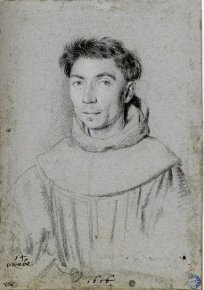 He had also been in charge of the scholarly research for the exhibition Le plaisir au dessin, also in Lyon (see article) and had written many of the entries for the volume on Florence in the 2006 exhibitions.